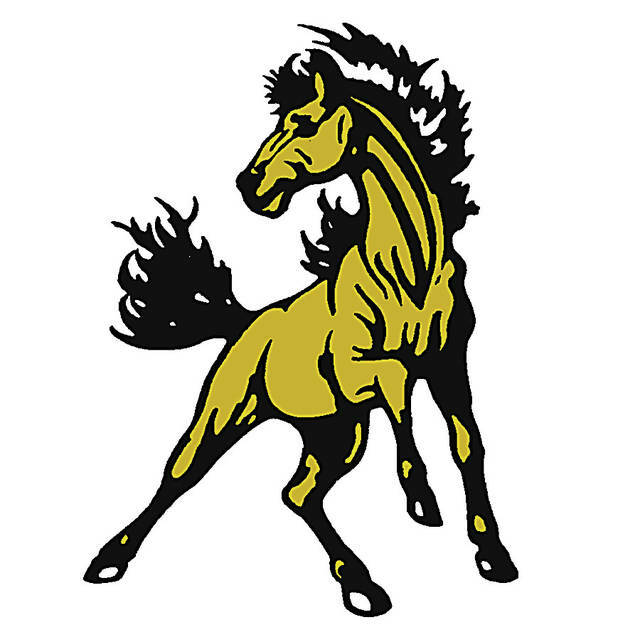 DODSONVILLE – The Lynchburg-Clay Mustangs competed hard all night Friday against the visitors from West Union, but a pivotal 12-0 run near the end of the second quarter in favor of the Dragons would see the Mustangs down 34-21 at the half. Although Lynchburg-Clay would cut the lead to eight and nine points on some occasions, the Dragons always answered with short runs of their own. After the night concluded, the Dragons would leave Lynchburg-Clay with a 66 to 49 victory. Lynchburg-Clay was led in scoring on the evening by Raymond Conner, who finished with a double-double as he had 19 points and 10 rebounds. Conner also shot 53 percent from the field, making eight of 15 attempts, with one of those being a three-point field goal, and two for two from the charity stripe. He also had three steals. Noah Miller was next in the scoring for the Mustangs with 13 points. Miller shot six of 11 from the field for 55 percent, as well as went one for one for one form the line. Miller also took two charges on the evening. Tyler Stevens finished with eight points, netting two three-point field goals and one two-point field goal. Blake Marcelino scored four points on a pair of two-point field goals, while David Giordano made a three-point field goal for three points. Andrew Cumberland rounded out the scoring for the Mustangs with two points on one field goal, and was 0 for two from the free-throw line. Cumberland also led the Mustangs with three steals and four assists on the evening. As a team, Lynchburg-Clay totaled 17 turnovers on the evening and finished three of five from the free-throw line. For West Union, they were led in scoring by Zane Kingsolver with 20 points, followed by Bowen Tomlin with 16. Conner Campbell had eight points, while Ryan Rothwell had seven. Tanner Neal scored six points, while Cameron Campbell had five. Clayton Madden and Bryce Staten each had two. West Union was six of 14 from the free-throw line and finished with 18 turnovers. The Mustangs were victorious in JV and freshmen action on the evening. In the JV game, Lynchburg-Clay took the contest 33 to 26. Chase Smaltz led the Mustangs with 16 points, followed by Patrick Brown with nine. Zander Blankenship added five points, while Connor Tyree netted two. Josh Niehaus rounded out the scoring with one point. West Union was led in scoring by Dakota Jarvis with 11 points. Clayton Jones and Braxton Blanton each scored seven, while Phillip Jarvis rounded out the scoring with one. Barnhill and Austin Wilkin rounded out the scoring with two each. For West Union, they were led by Braxton Shoemaker with six points. Bobby Gallowitz scored five points, while Avery Condon scored four. Aden Weeks scored two, and Tristian King rounded out the scoring with one point. The Mustangs will be back in action Tuesday night as they host Georgetown in a non- conference game. Freshmen start time for that game will be 5:00 PM. Matt Carson, the Mustangs’ Head Coach, submitted this story.